I wasn’t expecting today to be a jam day. Too hot to use the stove, even with A/C. Too many other things to do. And even though I was almost out of last week’s batch of blueberry-Earl Grey, I didn’t want to make it again. I did have blueberries, but the only Earl Grey in the cupboards was a box of decaf teabags and I felt the flavor they imparted was too subtle. I also had a couple of peaches that were a little too close to going off. 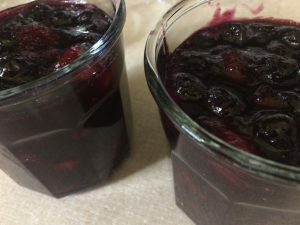 I had seen recipes for peach-blueberry pie before, so I knew the two fruits could be combined. I also had chai teabags. Stash Spice Dragon Red Chai, to be exact. So, experiment. I followed the America’s Test Kitchen recipe from Foolproof Preserving except that I used 5 chai teabags instead of 5 Earl Grey, and added a half tablespoon more low/no sugar pectin to compensate for the additional fruit. I also added a healthy pinch of salt because I believe sweet things benefit from a little sodium chloride. I haven’t chilled it yet, but it’s delicious at room temp. The spices add depth and warmth. It would, I think, make a dandy tart or pie filling. The peaches add a nice side note, but the blueberries by themselves would be just fine. So would peaches, nectarines, or even plums. I don’t think I’m going back to Earl Grey.